1. Establish some form of interagency forum, collaborative, cooperative, council or cabinet. 2. Agree on the importance of performance, and get everyone on the same page about how to develop and use performance measures. 3. Select the most important measures for both the individual agencies and for the system as a whole. Using the methodology presented here, this should lead to a short list of headline measures and a data development agenda. 4. Turn the data people loose on gathering this data. And allocate some resources to develop new data. 5. Create a regular process for leadership to review and act on the system performance data. This means having staff prepare as much as possible (the story behind the baselines, etc.) but it also means that the leadership engage in some serious deliberation about what works and what they propose to do. And it means that they must seriously engage their current and potential partners in considering options and taking action. (1) Cross agency service systems are part of performance measurement because they have customers. 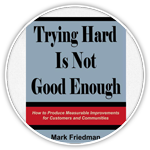 Any time you can identify a group of customers, then you are dealing with performance measurement as opposed to whole population well-being (results and indicators). (2) So with service systems, we are in effect drawing a larger fence around a set of services which span beyond a single department or organization. The fundamental questions still apply. How much service are we delivering (upper left); how well are we delivering that service (upper right); and is anyone better off (lower left and right)? Just as these questions are asked of individual programs, they can be asked about the system as a whole. 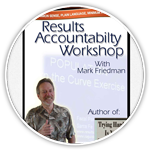 (3) The principle issue in performance accountability for systems (as opposed to programs or agencies) is WHO is accountable. There are usually not clear administrative structures which oversee such systems. And accountability is often confused at best. There are sometimes Children’s Cabinets or Children’s Councils or Collaboratives that try to play this role. But such accountability is often a weak matter of convention and agreement, not grounded in law. (4) The second challenge in systems performance measurement is the difference in the way data systems define and count things. Creating an aggregate picture can be difficult for even the most basic kind of information, like how many clients are served. And unduplicated counts can be hard to establish. (5) There is however great value in looking at system performance in addition to program and agency performance. The principle reason is the interconnection and interdependence of different parts of the service system. Customers/clients and taxpayers expect us to make sense of these systems. And performance measurement and accountability is one way to drive such an effort. (6) OK, so how do you do it? If you have not already done so, establish some form of interagency forum, collaborative, cooperative, council or cabinet. Agree on the importance of performance, and get everyone on the same page about how to develop and use performance measures. Select the most important measures for both the individual agencies and for the system as a whole. Using the methodology presented here, this should lead to a short list of headline measures and a data development agenda. Turn the data people loose on gathering this data. And allocate some resources to develop new data. 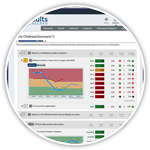 Create a regular process for leadership to review and act on the system performance data. This means having staff prepare as much as possible (the story behind the baselines, etc.) but it also means that the leadership engage in some serious deliberation about what works and what they propose to do. And it means that they must seriously engage their current and potential partners in considering options and taking action. Make sure that there is some measure which gets at the customer view of the whole system. This may require new data development through a customer survey. But something like: # of different offices I had to go to in the last month. # or different workers assigned to my case would be a good start.